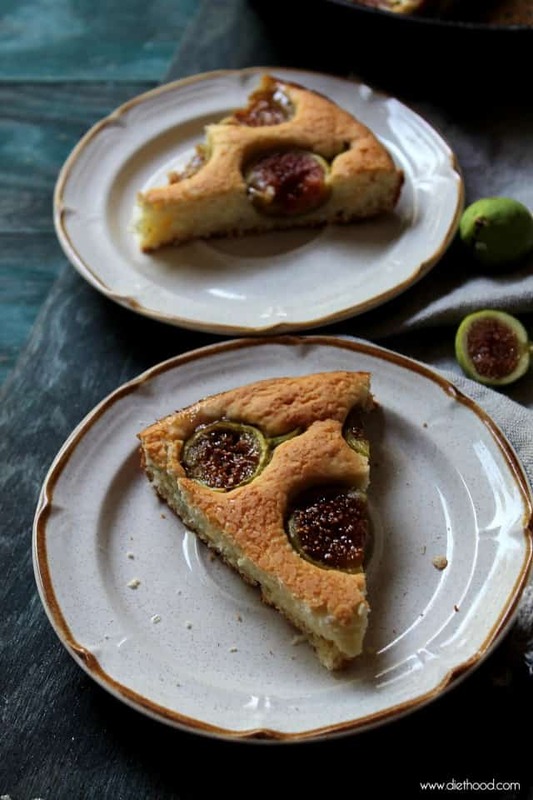 Figs and Lemon Cake – Sweet and delicious yogurt cake made with lemon and fresh figs. Oh gooooood heavens, Fig and Lemon CAKE! This is how all Mondays should start!! Ain’t she a beauty?! Love her! By the ways, it’s been FORever since we had cake around here. Remember that Tropical Banana Pound Cake?! YUMMMM! Would you believe that my mother, the one that weighs like 92-pounds, ate 3-quarters of this cake?!? 3/4! I’m not kidding. She just inhaled it! I was all like, hellloooo, what about me?! And she was like, hellloooo, I’m thinner – my hips need it! And I was like, OH HELL NO, Hunnay Boo Boo Child!!! And… So … I made another cake. And ate 1/2 of it. I gave the other half to my pregnant neighbor. She needs it. I guess. It might have something to do with the fact that I took care of it (read: I didn’t do jack – forgot all about it) while the parental unit was on vacay in Macedonia… Ooopsie Daisy. I was too busy taking care of my own tomatoes, basil… and peppers and cucumbers… But, I really wish I had taken care of it because figs are expensive! I had to make this cake 3 times before I finally got a photo of it. The figs, alone, cost half of my arm. I must say, though, that this is by far the best breakdessertfast I have had to date. I can’t stop thinking about it. It’s beyond! The cake is soft, but dense and crumbly. It is also sweet, but with subtle hints of citrus. And the figs are just plain amazing – fresh, soft, and delicious. When you bite into them, you get these bursts of little pouches filled with honey. I’m telling you – it’s pretty incredible. I can’t deal! You need to make this cake as soon as now. Like, immediately! 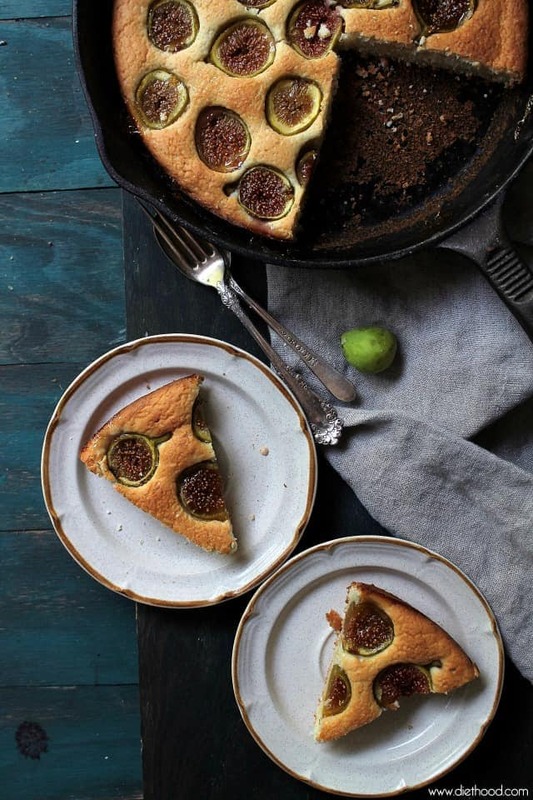 Sweet and delicious yogurt cake made with lemon and fresh figs. Butter an 8-inch cast-iron skillet and set aside. In a small mixing bowl, whisk together flour, baking powder, and baking soda; set aside. In your mixer's bowl, cream together butter and sugar until light and fluffy. Add egg and continue to beat until mixed. Mix in zest and vanilla; beat until thoroughly combined. Set your mixer on the lowest setting and add flour mixture in batches, alternating with yogurt and beginning and ending with flour. Pour batter into the skillet. Using an offset spatula, spread the batter evenly and smooth it out. Add figs on top, face up, and push them into the batter. Sprinkle cake with turbinado sugar. Bake for 30 to 35 minutes, or until a toothpick inserted in the center of the cake comes out clean. So delicious! I had better results with regular yogurt than with Greek. Also made it with lime zest bc I was out of lemons and it tastes just as great! How do you think this would work using Yoplait lemon fie flavored yogurt? I think it would give it a more lemony flavor! Can I make it with dried figs? Hi Mary Jane! Yes, you can use dried figs, but expect them to sink into the cake because they are somewhat lighter than fresh figs. Also, the dried figs will add a chewy texture, but if you don’t mind that, then go for it… I would!! 🙂 Let me know how it turns out. Have a great night! Hi! I was wondering if you could tell me what kind of yogurt is best to use. Vanilla, plain, greek? Or is it just a preference thing? I use Dannon’s plain yogurt…the texture wasn’t quite right with the thicker yogurt. I won’t say that I plan my half marathon training walks down the alley that has a laden fig tree with branches that stretch over the alley so I can keep one foot on the common area, reach up, and . . . . no, I’ve said too much already. I love fresh figs, That’s all I’ll ‘fess up to. Figs are my favorite new discovery! This cake makes such great use of them. Trader Joe’s has them pretty reasonably priced. Love this cake! It looks delicious! Soft, but dense and crumbly… I’m totally sold!!! How did they react to the figless tree when they got home??? My neighbour has a tree FULL with figs in Skopje and I’ll take some and make this recipe x2 for us and for him! I wish my mom baked with figs when I was small then I would love figs all my life. Since she just cut it up and serve it, I never liked it when I was small. Then I found figs in cake. Oh my, it’s so good! I can imagine how delicious this cake is. Love the skillet cake too. I’m going to grab some figs! So pretty and it sounds divine! This is TOTALLY beautiful!!! I haven’t made anything with figs this year because last year we were gifted A TON and this year people are being stingy with the figs. And I need half my arm. Just popped the cake in the oven, batter tasted yummy! I converted it to gluten free, TY for the inspiration and using all these figs up!!!! Oh HELLO!!!! This is INCREDIBLE!!!! Hi Terah! Did you make it? LOL! I hear you!! Tell me how it tastes with the blueberries… I’m sure it will be excellent! The figs are so pretty in the cake. Everything looks amazing! 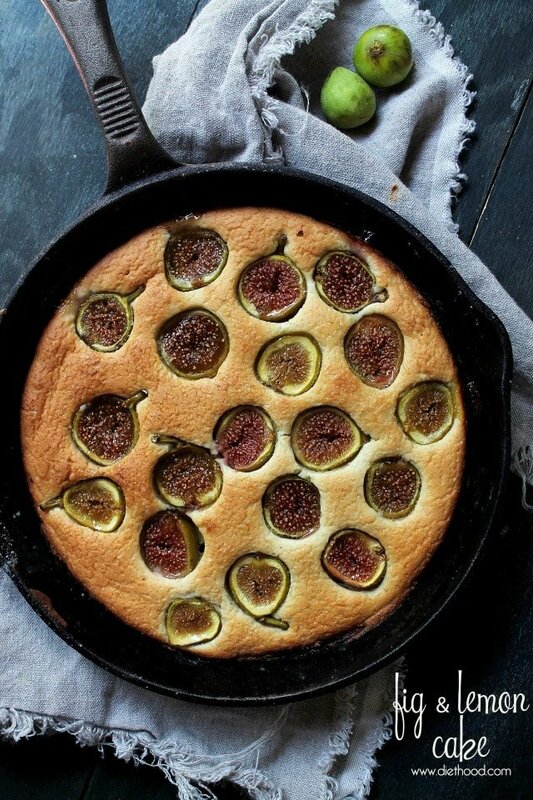 I’m totally obsessed with figs right now and this cake needs to be in my kitchen! 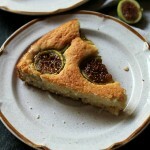 What a cool cake… I love fig recipes. I am also crazy to try figs paired up with lemon cake… YUM! Gorgeous! Love everything about this! You know I’m all about cake on Mondays. Gorg!! This looks amazing! But I can’t find cast iron pans where I live overseas. Do you think it would work in a round cake pan? Hi Khadijah! Thanks for the great question!! Yes, you can definitely make this in a cake pan, but the time may vary a little… just keep an eye on it after 28 minutes. I’ve seen so many fig recipes this summer and they all look amazing. Must be delicious with the lemon! This is gorgeous Kate! I love cakes like this, one pan perfect. I have been trying to find fresh figs everywhere! I think I live in the wrong part of the country for that! This looks great! Nancy, it’s hard to find them around here, too. I’m in Northwest Indiana… not anywhere near fig growers. 😉 I found the figs at one Farmer’s Market and they were $7 a pint … ouchy. This looks absolutely divine. How could you not like figs with a hint of citrus……YUM! Your pictures just want to make me dive right into it. You take the BEST pictures. I feel like this cake is RIGHT there! Gorgeous!